Kids spend so much of their lives at school. As educators, we can have huge influence on their day-to-day activities and conversations, so how school leaders and teachers respond to conflict and controversial topics is critical to student development. Students look to educators as models for navigating life’s everyday and, oftentimes, difficult situations. As such, it’s crucial that teachers acknowledge students’ backgrounds, realities and differences when approaching tough, and potentially controversial, topics and situations. So—what do you do when a tough conversation comes up? This may seem like the easiest thing to do when you’re unsure of how to respond, but ignoring these issues doesn’t make them disappear. In fact, brushing contentious conversations aside can often cause tension and misunderstanding to grow. Remember that, usually, if one student says something controversial, it’s likely that other students are thinking about it too. It’s important to recognize that tough questions usually come up because they’re present in the lives of our students. When structured properly, the conversations that result from contentious questions can be some of the most meaningful school experiences for students. 2. Turn it into a classroom discussion. Addressing difficult questions through thoughtful, structured conversation is an important next step. Not only does this show students you are listening, validating their own experiences, but it also develops critical thinking skills. Remember: you don’t have to take a position on a topic! Avoid stating how you feel, instead focus on guiding the conversation for your students. Listen, ask questions and give students the background information and tools they need to be actively engaged in group discussion. Listen to every voice. Make sure you and your students are listening one anothers’ views. Share with students what listening looks like—”Eyes on the person speaking, no talking while others are talking or interrupting…"
Use “I” statements rather than “you” statements. It is important for all students to feel safe, and using statements that start with “you” can isolate students and make them feel attacked. Make sure students are speaking to their beliefs and experiences, and not others’. Decide how students will share their views. Will students raise their hands or take turns speaking? Set that expectation beforehand so every student feels included and heard. 4. Push yourself, push your students. Be confident—these conversations are difficult for people of every age, and it is OK to make a mistake! Be open to learning with your students, making mistakes with your students and empowering yourself through information and knowledge with your students. It is always better to address an issue rather than shying away from it. If you don’t know something, have your students do research about the topic from credible sources. It can be tough to confront difficult conversations in the classroom. As you decide on your approach, consider shifting your mindset. Rather than getting worried and frustrated about confronting these problems, consider instead the opportunities for learning they present for both you and your students. As you guide constructive and critical conversations in your classroom, remember that you are facilitating high-level thinking while allowing students to practice speaking and listening skills. These discussions allow students to learn from peers as they engage in meaningful conversations, listening to one another's’ ideas. Some of the deepest and best learning occurs when students are emotionally invested in what they are talking about. Use this to your advantage and face critical conversations with a careful and confident approach! You’ll be amazed by the learning that results. 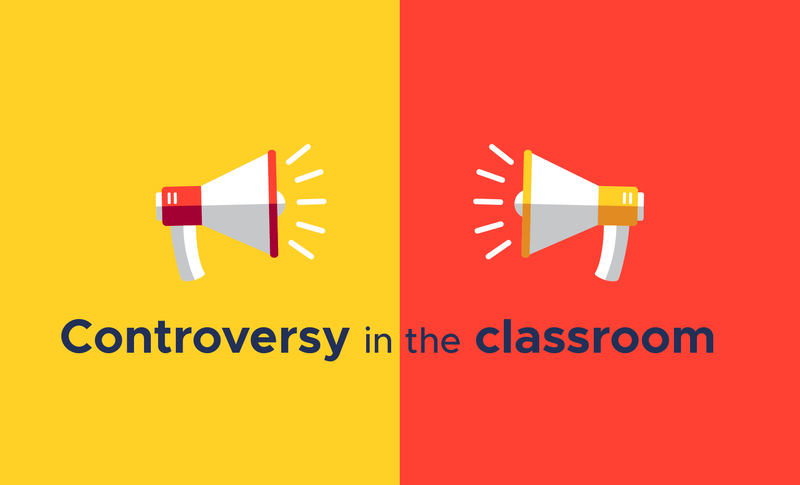 For tools and resources on addressing controversial topics in the classroom, check out the collections below.